This inkjet fax strives to offer home users and small businesses a more affordable way to transmit messages while enjoying long-lasting output. With the Canon Fax-JX500 inkjet fax, they can have the perks of a high-end inkjet printer with a speedy fax modem and other features to help increase productivity while fulfilling the basic communication needs. However, the Fax JX500 needs better paper handling and improved telephony features. The Canon Fax JX500 is a standard 33.6Kbps fax machine with a handset and answering machine, compatible with group 3 and PSTN line. It uses inkjet print technology with a sheet-fed scanner. Up to 100 sheets can be loaded into the paper feed at the rear. The Canon JX500 fax machine is also integrated with a 600x600dpi copier, and users can navigate through the controls with the 1-line, 16-character LCD screen in the heart of the control panel. The entire device weighs around 4.1kg and measures 294mm thick, 306mm deep, and 400mm wide. 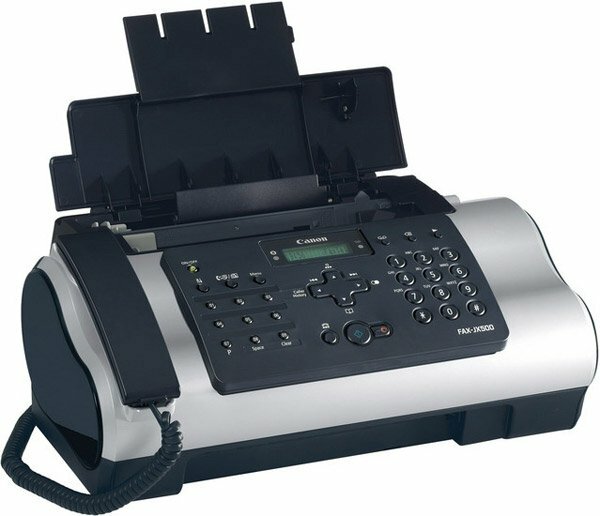 This super G3 compatible fax machine comes with a digital answering machine and ample memory for 120 pages of fax transmissions and 109 speed dials. Budget-conscious users can scrimp with the ink saver mode of the Canon Fax JX 500 and leave the device unattended because it boasts a 20-sheet automatic document feeder. The Canon JX-500 fax is reasonably fast when printing, at approximately 6 pages per minute or 10 seconds per page. The Canon Fax JX500 inkjet printer is also integrated with comprehensive telephony features. Users complained about background noise and echo while making phone calls, recording a message, and when there are incoming messages. The Canon Fax JX-500 machine is also difficult to set-up because of poor documentation, while the busy control panel prevents users from quickly learning the basic functions of the device. Ample space is required in front of the Canon Fax JX500 so paper coming out of it won't fall to the floor.